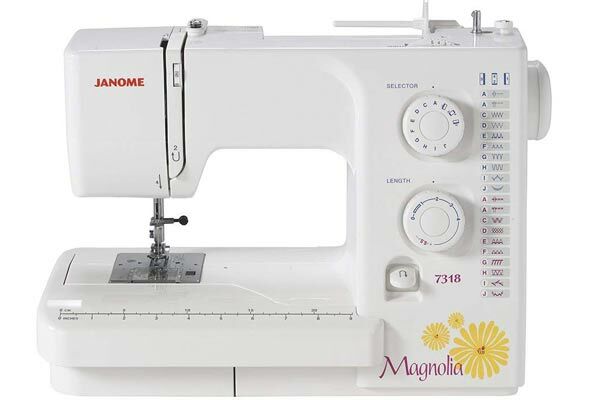 Janome Magnolia 7318 Review - Is It Worth Buying? Judging by the name alone, most people would guess that Janome hails its origin from southern parts of the United States, but in fact Janome is thoroughly Japanese. Founded in 1979, Janome specialized in sewing machines, and even their very first one was computerized. Today, Janome offers a comprehensive range of sewing machines and accompanying accessories. The Janome Magnolia 7318 sewing machine is their entry-level model, as you might have guessed by the prominent yellow flower, probably there to ease the tension of working with a sewing machine. Unfortunately, although it is intended for beginners, the price is somewhat steeper when compared to sewing machines from other companies, like Brother or Singer. What sewing work can you actually do with it? Among many other things to keep in mind, so keep reading on! 2 What can beginners expect? Stitch width at 5mm and length at 4mm, both are maximum values. Analogue stitch selection in the form of a dial. Feed dog capacity of 5 pieces. Top-loading bobbin hook and jam-proof bobbin system. Manual control for thread tension. Extra high lift for foot presser. Overall, it weighs 17.6lbs and it requires a moderately-sized workspace of 6.2” in width and 4.5” in height. The warranty is 2 years, which is a stark difference from 25 years that you get from the other two aforementioned companies. The process is not complicated, but with one exception regarding convenience. As a company that prides itself in offering one of the first computerized sewing machines, they didn’t feel the need to extend the benefits of automation to this model. Therefore, you won’t find an automatic needle threader, which is always convenient and not that much of an exception with other sewing machine brands. Likewise, button sewing is a 4-step procedure, while almost all other machines offer a 1-step buttonhole making. And you won’t perform an exceptional button work to begin with, definitely not superior to the 1-step buttonhole feature. Furthermore, working with it requires you to read the manual in quite a thorough manner. The lack of automatic features accentuates this need, as you will need to constantly stay focused. You can do precise work, but it will require more effort. Not an approach you would expect from an entry-level sewing machine. Still, it is a mechanical machine, not marketed as ‘fully computerized’, like has become a custom in the industry for the last few years. However, with all that being said, it may be more perceptive to view the Magnolia 7318 as great for beginners precisely because of lack of automation. After all, one would need to really learn their sewing craft, and also have more control in the process. Also, it needs to be said that the guide is very well illustrated and will be easy to follow, so you should really not skip on a single page until you find the whole manual as redundant. What will greatly help your performance even further are the included extra high presser foot lift and the drop feed dog. True, you will have to thread the needle yourself, and the buttonhole work could have been a 1-step process instead of 4, but you will be able to perform all of the tasks with admirable efficiency thanks to the small touches. For example, the needle eye is front-facing so you will avoid contorting your neck. Additionally, the thread cutter will save you a lot of thread, and will become something of a default feature that makes the sewing work that much easier. It is located just beneath the face plate, so it is simple to reach without much hassle. While other machines in the same price range may nominally offer a huge stitch range span (up to even a 100), 18 stitches may seem like an exceedingly restrictive number. However, every single one of those stitch types will make it count. You will be able to make garments, quilts, regular clothing, and decorative design. Just the right number of stitches to not overwhelm you, but instead giving you an ample opportunity to master each type. The stitching dial is excellent, allowing you to switch between stitches on the fly with a flick of the wrist. Definitely not as involved and confusing as with ‘fully computerized’ sewing machines with LCD screens. All 18 stitches are clearly displayed right next to the dial. Feet interchangeability – It’s a rarity that a company doesn’t force you to have exact parts from the same company. In fact, many go that extra step to make sure any other part is not compatible. This is not the case , specifically regarding the different feet. As long as feet pressers are of standardized size, you will not find an issue with compatibility from any other brand. Build quality – Although entry-level mechanical sewing machine, Janome 7318 is of high build quality. Warranty length notwithstanding, it is sturdy enough to last you for at least a decade. But more importantly, it is very stable to work with. No bouncing or wiggling worthy of note, which will further aid in keeping your sewing tight and precise. Transparent bobbin – allows you to gauge if you will be able to complete your current sewing project. Really nice touch, as it can be quite frustrating to break work halfway through. This should become a standard feature for all sewing machines. Janome Magnolia 7318 doesn’t bandy about with ‘computerized’ or ‘fully computerized’. It is a mechanical sewing machine, but one that is a joy to work with once you get the hang of it. Indeed, you will find in many buyers’ reviews that people have even given up their much cheaper computerized sewing machines for this model precisely because you can get work done beyond the beginner level. It offers that much control and precision. Most errors that are likely to be encountered will be caused by your lack of attention, or due to not reading the excellent manual thoroughly. Clearly, the slightly higher price tag is warranted by its admirable build quality, dependency, and anti-jamming features. As such, it is easy to recommend it as a high-quality entry-level option which can be easily extended beyond the beginner level. This is why we highly recommend it as one of the best sewing machines for kids in our guide, as it has enough options to grow with them. After all, do remember that today’s sewing machines are by default superior to anything you may have used even a decade ago. And the 7318 model goes a step further than that.